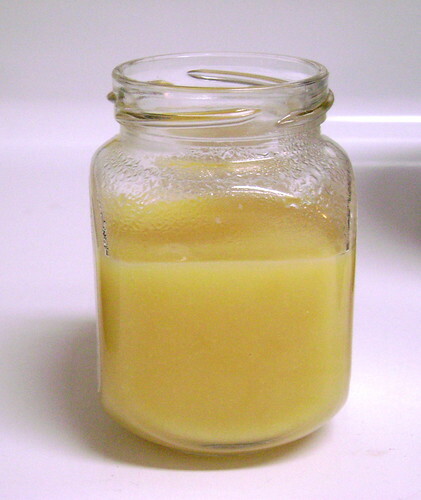 The usual or at least traditional method of making lemon curd is using it with a double boiler, or a stove-proof bowl stacked over a pot of simmering water. Another way, and generally faster, is cooking the lemon curd in the pot, over direct heat. As this version is dairy-free, a small amount of coconut milk is used in place of butter and is added after the lemon curd is cooked. This is optional, but I find that the coconut milk helps dull the lemon’s acidic aftertaste and also makes the curd creamy, without it tasting like coconut in the slightest. Though it is a choice of personal preference, it is sometimes a good idea to strain the lemon juice so that it doesn’t have pulp or those really fine little seeds. I usually use a precise measurement of 1/4 cup of honey, yet I leave the option of adding to taste open as some people I know prefer the lemon curd to be a little more on the tart side. In the video, I show the measurement of the lemon juice twice – this is because I don’t consistently observe the differences between dry and liquid measuring cups. I thought measuring liquids using either was the same and didn’t make a difference, until I made the video and saw that 1/2 cup of lemon juice, using the dry ingredient-measuring cup, is actually less than what would be measured using a measuring cup meant for measuring liquid. If doubling this recipe, increase the amount of all ingredients except for the lemon juice; flavour or consistency won’t be affected. Heat a pot with some water over medium heat until it reaches a simmer (gently boiling). Meanwhile, whisk together the egg yolks and honey as if making custard in a stove-proof bowl. Stir in the lemon juice. Balance the bowl on top of the pot (making sure the bottom doesn’t touch the water) and cook the lemon curd for about 15 to 25 minutes or until thickened to a consistency similar to yogurt. It should coat the back of a spoon. Remove the lemon curd from heat and cool. Stir in the coconut milk if using. It will continue to thicken as it cools. Cool to room temperature before covering and store in the fridge. In a small saucepan mix together the egg yolks and honey; add the lemon juice. Set over medium heat and cook, stirring with a whisk or spoon until steaming but do not let it boil. Stir frequently and continue to cook until thickened and coats the back of the spoon, about 10 minutes. Transfer to a container and cool to room temperature. It will continue to thicken as it cools. Cover and store in the fridge. This video is also available in smaller, shorter segments, with the two cooking techniques shown in their own individual videos. Click here and here to watch. No problem! I’m glad this could be of help to you. Let me know how it works out for you. Hi Michelle, it’s canned coconut milk. Coconut milk beverage might work, too, though I haven’t tried it with this recipe. Hope you like it!